To be cliche for a moment: where did my summer go?? Summer break has always felt really long to me since I started University, but now I feel like I worked my summer away! Anyway, I've been very good this month and I haven't bought a lot of new makeup products. I finished up a lot and have started on my backups, which helped me discover some new things that I love! The only beauty order I made this month was when the Ordinary restocked their crazy-popular foundations. I couldn't miss an opportunity like that, so I picked up both of their foundations along with some skincare treats. 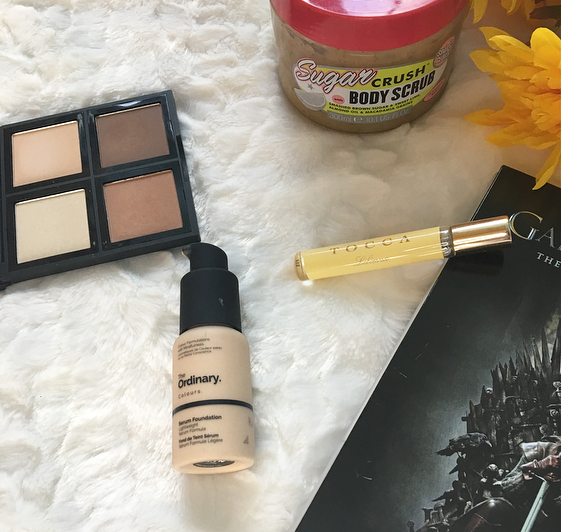 While I like the Coverage foundation, the Serum foundation is a summer staple for me. 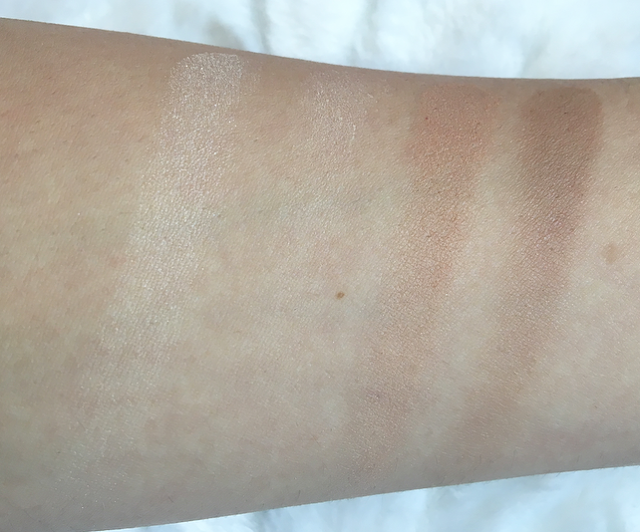 It has a good amount of pigmentation to it in a very lightweight formula. I think I will continue to wear it throughout the winter, especially because this shade is just a hint too light for me at the moment. A great alternative to the big, bulky contour palettes is this quad from Elf. It's only $6 and every shade has a good use to it. There's a shimmery, nice highlighter, a matte highlighting powder, a warm matte bronzer, and a cool matte contour. They are very good quality and I love the contour shade in here! Unfortunately it is hard to find cruelty-free fragrances, but Tocca is one of the few high-end brands that is. I really like their Simone fragrance and there were a lot of others that sounded nice, but I didn't want to spend the money on them in case I wouldn't like them. Sephora had a set of 10 Tocca sprays for sale, including a lot of the ones I wanted to try out, so I ordered it in July and have been trying them out ever since. The standout one for me is Liliana, which has notes of Italian Bergamot, Neroli, Watery Peach, Muguet, Gardenia, Sandalwood, and more. To me this smells almost exactly like Marc Jacobs Daisy, which isn't cruelty-free. I want to order a larger size soon because I'm sure to run out of this little spray soon! I finished up two scrubs over the past month (I have a problem) and started using this amazing, lemonade-lime scented scrub. It's my first product from Soap and Glory and I'm very impressed! It's not as rough as I was expecting but is a great body scrub. The scent is definitely my favorite part, it's mouthwatering and perfect for summer. This is what I wanted Lush's Ocean Salt to smell like! Everyone that I know is obsessed with the Office and while I watched it casually, I never found it as funny as some of my other favorite comedy shows. I don't know what changed for me but since I started season two I've been laughing every episode! If you like Parks and Recreation, It's Always Sunny in Philadelphia, or 30 Rock I think you would love this. I know I included this show in last months favorites post but it's just so good! It's honestly the best show on TV right now. I've read all the books but since the show has surpassed the books (and George R. R. Martin hasn't finished the series yet) I'm surprised and intrigued by every episode. The acting and effects are phenomenal, the twists are fresh, and the action is nail-biting. I really think that everyone should give it a try even if they aren't a big fan of fantasy, otherwise you might be missing out on one of the best shows of all time. I love the Mortal Instruments series so I decided to start reading the sort of prequel series to it. The first book is Clockwork Angel and I'm currently on Clockwork Prince. This series is about Tessa, an American girl who moves to London to live with her brother and is kidnapped by two women who teach/force her to use her power of shapeshifting. She is rescued shortly after and meets a group of Shadowhunters who want to help her solve the disappearance of her brother and the reason for her kidnapping. It's just as good as the original series and I'm really enjoying it so far! I have also been loving a bunch of other books which I covered in my Currently Reading post. My absolute favorite singer is Taylor Swift. Judge me or her all you want, I think she is such a talented songwriter and a good singer. 1989 is my all-time favorite album so I have eagerly been awaiting new music from her since 2014! She finally dropped LWYMMD and while at first I didn't like it, I find it really catchy now. The music video is also incredible. If you have followed Swift and her personal life there are so many funny references in it, such as the I <3 TS t-shirts, the names on the gravestones, and the dialogue at the end. I'm really looking forward to Reputation! This month I donated to my friend Lyndsey, who has been struggling with POTS syndrome for a few years now and was recently accepted to a rehabilitation program at the Mayo Clinic. A lot of the expenses for the program aren't covered by her insurance so she was raising money for the treatment. She and her mom reached their goal of $5000 but if you would like to help out I'm sure they would appreciate it! As always I would love to know what you're into this month! 18 comments on "August Favorites"
The Sugar Crush Scrub is amazing! I love it so much, I really need to buy it again. I'll have to check out The Office then because I loved 30 Rock. The Mindy Project is my current favourite comedy to binge watch on Netflix! Nothing wrong with that! Music is such a personal thing. Game of Thrones has been amazing! I'm so frustrated at the thought that we are all going to have to wait at least 2 years for the final series. I hope it is just as good as this season has been! I had no idea about Clockwork Angel! I adore the Mortal Instrument series so I know I will love this one too. I started watching the Office this year and I love it. I found the first season to be super cringe, got better in season 2 though. Now I just finished Season 3 its hilarious.